I'm going to be playing banjo (again!! 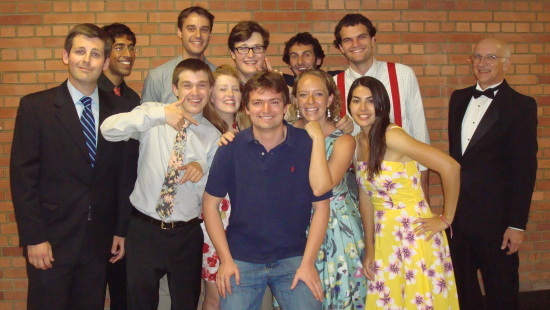 :) with the 2010-2011 UCLA Bluegrass & Old-Time String Band for their final performance of the school year. What can you expect? You can find lots of photos and YouTube videos on my other post about a recent ensemble gig. We're playing in Schoenerg Hall, on the UCLA campus. Schoenberg Hall is the main auditorium in the Schoenberg Music Building. The gig is on Sunday, 5/15/2011, in the evening. Come out and see us! Admission is FREE! :) Parking is $10 in Parking Structure #2. The Bluegrass Ensemble goes on at about 8:00 PM, after the Balkans Ensemble (which starts at 7:00 PM). Follow the red line to enter Parking Structure #2 at the bottom level to use the Self-Service Parking Pay Station. Schoenberg Music Building is located at Hilgard and Westholme in Los Angeles, CA. 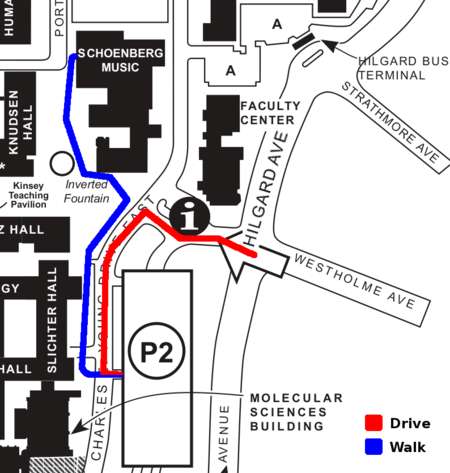 Parking is available at Parking Structure #2 via the Self-Service Parking Pay Station (please see the map above). Schoenberg Hall is located at the very north end of the building.